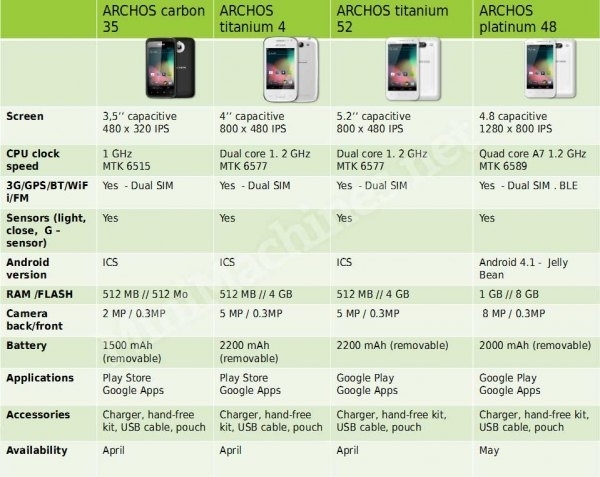 Archos rumoured to release four phones: We've heard about three of them before! We've actually heard rumours about a set of phones from Archos before. We saw this leak just before MWC earlier in the year and we expect to see the phones at the show. Seeing as the phones didn't turn up there the devices slipped into the backs of our minds, until now! It seems that the guys over at Lilliputing have managed to get their hands on a screenshot which seemingly proves the existence of a budget Android handset from the French company which you can see pictured below! As you can see the image doesn't give away too much information aside from the fact that the device will cost 82 euros to buy and that it has 4GB of internal storage. However, shortly after this original image was spotted there was the following chart which seemingly shows off four new smartphones spotted by the guys at MiniMachines. "An Archos Carbon 35 [with] a 480 x 320p screen, single core processor and 512MB of RAM and a shockingly small 512MB of storage. Obviously this is a budget device and it has a rumoured price tag of 90 Euros." That is remarkably close to the what today's rumours seem to suggest too! "A 4.8 inch, 1280 x 800p screen rumoured to be paired with a 1.7 GHz Mediatek MT6589 quad-core ARM Cortex-A7 processor. The supposed 249 Euro price tag reflects the bump in quality of the components." Now this one isn't quite as close, but the screen size and resolution seem to be close to the mark as does the quad-core Mediatek processor! "800 x 480p screen, which we really hope[d] [was]n't true because that will not be very nice to look at! Other than that the rumour mill hasn't offered up too much other than a 1.2 GHz dual core processor." Again both of those seem to agree with the device in the chart above. The 'Titanium 4' is the only one which we haven't heard anything about before, but it definitely seems to have a place as a mid-range phone in this line-up. Obviously this is all still rumour at this point, but now we've heard about these devices on multiple occasions, it's getting safer to assume that these will be on shelves at some point this calender year!